UPDATE JUNE 28: A police arrest report is providing more details surrounding the alleged domestic dispute involving Jersey Shore star Ronnie Ortiz-Magro and his ex-girlfriend Jennifer Harley. The report states officers arrived to find Ronnie Ortiz-Magro sitting alone behind the wheel of a white Mercedes Benz near Russell Road and Durango Drive. The Mercedes had two flat tires and blood was smeared all over the center console and inside the car. Ronnie had injuries to his mouth and arms, along with road rash. Ronnie explained to officers that he got into an argument with his child's mother, Jennifer Harley, after leaving a pool party. He says he was in the passenger seat when Harley hit him 2 to 5 times with her right hand. Ronnie then said she drove the car over a concrete median flattening the tires. As he attempted to exit the vehicle, Harley drove off, dragging him. He admitted that his 3-month-old daughter was in the backseat during the event. Ronnie then told officers he called Harley to turn back and pick him up, which she did. When she got to where he was, she exited the vehicle, removed the child from the back seat, and began screaming for help claiming that Ronnie was attempting to take her baby away. Ronnie then jumped into the driver's seat and drove southbound to a PT's Ranch on Sunset and Durango. That is where police eventually found him. Police found Harley at a 7-Eleven near Durango Drive near Russell Road. During their interview, officers saw minor scratches and dried blood on her. She told officers that Ronnie attempted to grab the steering wheel of the Mercedes, which caused her to drive over the median. She then says he began hitting her. She also said that she had a friend pick up her child from the 7-Eleven before officers arrived. Officers at the scene determined that it was a mutual battery incident, but the Harley was the aggressor. Harley was then placed under arrest for domestic battery and transported to the Clark County Detention Center. UPDATE 11 P.M.: 13 Action News spoke with CEO of Safe Nest Liz Ortenburger and she said it is time for the couple to seek help especially since their latest alleged domestic dispute played out in front of a child. 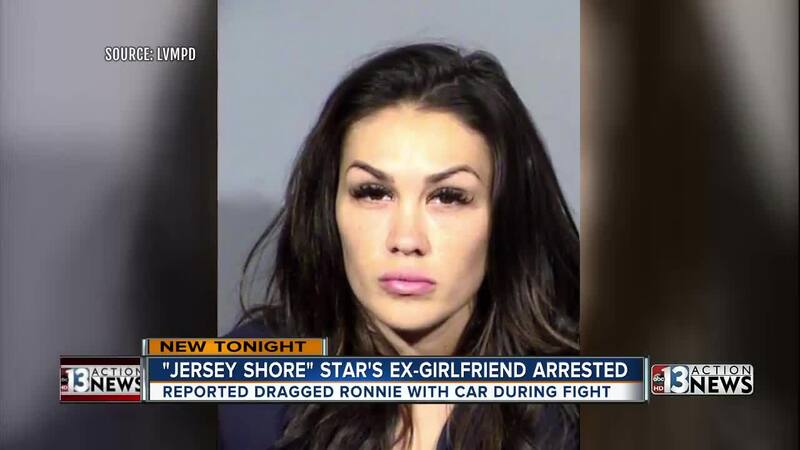 ORIGINAL STORY: Ronnie Ortiz-Magro's ex-girlfriend Jennifer "Jen" Harley, 31, was arrested in Las Vegas after she and the "Jersey Shore" star reportedly got into a fight after a barbecue. According to an arrest report obtained by 13 Action News, Jen hit Ronnie in the face while the pair were in a car and he demanded she pull over and let him out. Ronnie, 32, reportedly became entangled in the vehicle's seatbelt while exiting and she hit the gas. The pair's two-month-old child was also in the car. Las Vegas police say they received a call from a passerby around 10:22 p.m. June 24 regarding a suspicious vehicle with 2 flat tires near Durango Drive and Russell Road. The passerby also told police that they saw a man, who was bleeding, trying to pull a woman out of a car. When police officers arrived, they found a man walking away from the vehicle. They questioned the man and woman and determined that they were in a relationship and that the woman, Jen Harley, was the primary aggressor. Harley was arrested and booked into the Clark County Detention Center. She is facing a charge of domestic violence. This is not the first time that the pair have gotten into a heated argument. Police were also called earlier this month after the pair got into a fight at Planet Hollywood . Harley is a Las Vegas native.